New Ireland was delighted to sponsor the IAPF’s (Irish Association of Pension Funds) Annual Defined Contribution Conference which took place in the Printworks in Dublin Castle on Thursday 3rd May. Representing the interests of Irish occupational pension schemes in Ireland, the IAPF half day flagship event brought together over 250 pension trustees, pension schemes, HR and finance managers, policymakers and pension practitioners to consider and discuss the issues facing pension schemes today. 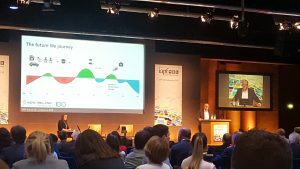 New Ireland’s Distribution Director, Ray Mc Kenna, was one of the key speakers at the event presenting on customer-centricity and the future of work. Ray assessed how the pensions industry is performing from the point of view of potential and current pension savers, asking if we are doing enough as an industry to create and maintain understanding, interest and engagement. Ray went on to highlight the impact of the forthcoming shifts in both the nature of life and the nature of work, which are driven by changes in technology, demographics and increasing life expectancy. With more people living to 100 and the increasing pace of technological developments, the future of work will involve portfolio careers, with more people working remotely from anywhere, at any time, on any device. He told the audience that life-long learning and reskilling will become the norm, and technological developments such as robotics and artificial intelligence will make some jobs redundant, but will also create new jobs that currently don’t exist. In this context, he called for the pensions industry to prepare for and embrace these changes and to use the opportunity to create digitally led pension solutions for the 21st Century, built on simplicity, flexibility and greater engagement.